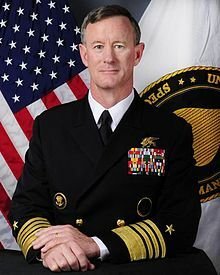 William Harry McRaven (born November 6, 1955) is a former United States Navy officer. He was the ninth commander of the United States Special Operations Command from August 8, 2011, to August 28, 2014. From 2015 to 2018, he was the chancellor of The University of Texas System. ↑ Lloyd, Jennifer R. (August 2, 2014). "Adm. McRaven will bring fearlessness, humble nature to UT System". San Antonio Express-News. Retrieved June 19, 2015. This page was last changed on 6 December 2018, at 02:38.